Corkscrew. In the racing fraternity, that word evokes just one picture, that of a terrifying corner that's unnerved many a top flight racer. It's one of the most formidable and technically challenging corners in all of motorsport history and it can be found at the Laguna Seca Racetrack in California. Around three weeks ago you'd have also found a fleet of Mercedes-AMG GT sportscars strafing the circuit. Between the two it was hard to decide what was more fun, making an attempt at taming the Corkscrew or taming the AMG GT. Don't guess, let me tell you. The obvious focus though is on the car, the AMG GT is in a small way the successor to the SLS AMG, but part from three common letters they are the chalk and cheese of the family. The SLS AMG is the supercar, big power, brash demeanour and audacious drool worthy looks. It's the poster child of a generation of Mercedes-Benz cars that were slowly clawing back their way into customers' psyche after losing ground to Audi and BMW. The AMG GT on the other hand is the herald of a whole new age where the compact, lightweight and the exotic must go hand in hand with efficiency and sustainability without losing out on things like fun, excitement and desirability. And so the AMG GT is a smaller version of the very best that Mercedes-Benz's performance division could come up with. The styling is pure roadster, elongated hood with a bulbous cabin that weighs up the rear. Unlike the SLS AMG though the trademark gullwing doors are absent on this car. Yet it's easy to grab eyeballs with this sportscar because it's low slung, has those meaty haunches and an in your face front end dominated by the dinner plate sized badge sitting in a honeycomb bed. Unlike the F-Type or the Porsche 911 its natural rivals, the AMG GT carries significantly more muscle all over giving it a more butch and masculine appeal. In the AMG GT you almost expect to lift the hood and find hair on its chest. And that chest is wide, expansive and ripped with muscle as well. Under the magnesium hood is a new 4.0-litre V8 engine that is turbocharged in the interests of efficiency and emissions without losing the oomph factor. This twin turbo unit sits in between the bank of cylinders making for a more efficient system and a tighter package. This engine has two levels of tune, in the standard GT version it delivers 462 horses with 600Nm, but the GT S I drove has 510PS with 650Nm making things interesting. It's a magnificent engine, one of the finest handmades to come out of Affalterbach with a strong and meaty power band where the torque peaks at just 1,750rpm and stays there until 5,000rpm. In full race mode the revs simply climb and climb to its 7,000rpm redline and there's tidal waves of power and torque just sweeping over the proceedings. So the long main straight with its kink in between turn 11 and the Andretti hairpin is covered in a heartbeat with the car feeling light and flighty. At these speeds, with the marginal direction changes and in elevation, most cars would be unsettled. 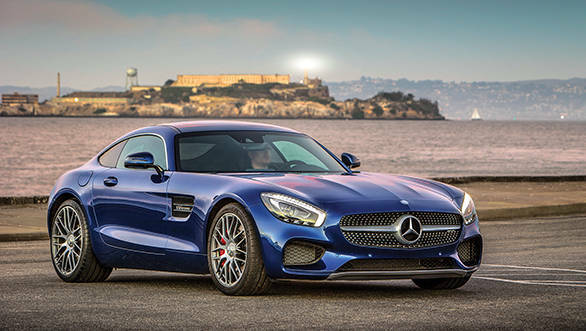 The AMG GT isn't any different here. There is a slight moment of indecision almost as if the car is unsure of what to do before it gets an eye over the crest at the kink. Then it knows in an instant the exact line to take, the right amount of balance to maintain when the carbon ceramic brakes are tensioned to keep things perfectly aligned for the upcoming double apex. Then it's back to hammering its way around the track. The engine with the 7-speed dual clutch transmission is placed just a wee bit behind the front axles, or what we call midship, so the 47:53 front to rear weight distribution achieved as a result is ideal for a car of this station. But just having the right bias isn't all, you need to shave weight and performance becomes a direct by-product. 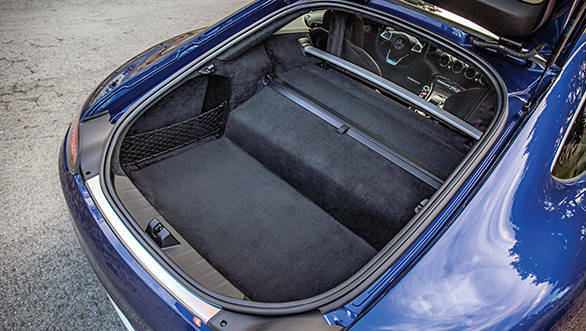 In the case of the AMG GT S, the chassis is light alloy, the boot lid steel, the hood magnesium; the suspension is aluminium and so on and so forth. 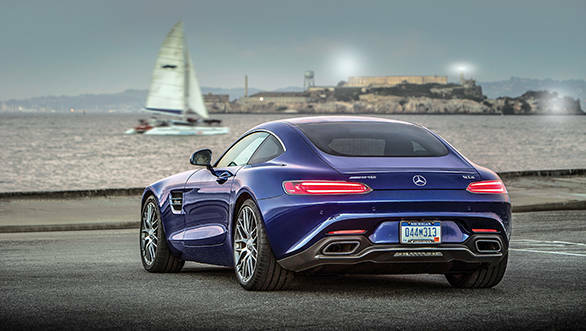 Over 90 per cent of components in the AMG GT S in fact are aluminium. So while power to weight is explosive, this also leads to a fantastic amount of dexterity on track. 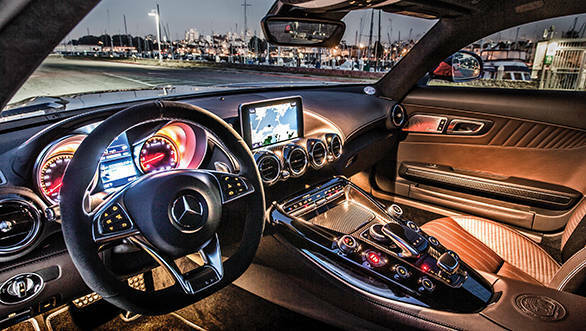 You can almost callously throw the AMG GT around the track and know that traction, an innate sense of direction and the thousands of on-board electronics will get it back on line in an instant. The only issues I had were with the sightlines ahead of that massively long hood which means at several sections around the track especially the Corkscrew which you anyway have very little sight of, you go into completely blind in the AMG GT. And another issue I had was with the exhaust note which is quite un-AMG-like. Despite the heavy investments in getting the right notes for the AMG GT's soundtrack it's not as tempestuous and soul moving as that of the benchmark C 63 AMG or even the SLS. Speaking to one of the several tech heads over dinner, the inside word is that the AMG GT isn't the sweetest sounding AMG in the fleet. In fact to get an idea of its full potential you have to slip it into Sport mode, thumb down the exhaust button on the centre stack to open up the exhaust valves and then punch the accelerator pedal to get the full effect of that V8. Except in California there is very little accelerator punching to be done unless you want the neighbourhood to run out on to their porch shotguns drawn, so you're better off just sticking the car in standard drive mode and driving it as sedately as a C-Class sedan. Talking of the driving modes, the AMG GT has five of these ranging from a standard Comfort mode all the way to a race mode. 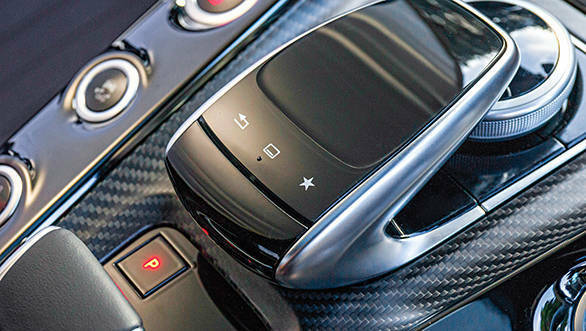 Each mode does various things to the AMG GT. In basic Comfort mode the suspension, steering, transmission and ECU map are at their most docile. As you go through Sport, Sport Plus to Race, you change various pre-set parameters. There is also an Individual mode which allows you to select your personal preferences between the various aspects like suspension, steering, exhaust, engine response etcetera. Now you can be a nutjob and choose the stiffest suspension setting with the quickest throttle response and sharpest exhaust notes and steering options but trust me, it's a waste. Save those settings for the racetrack because on most roads, the suspension is too stiff for comfort and you want a lighter effort on the steering wheel to manoeuvre the large and wide 265/35 R19 tyres at the front. Those tyres are sprung by some very stiff suspension, derived straight off from the racetrack. Double wishbones can be found at all four corners and these, along with several other components, are manufactured entirely out of forged aluminium. 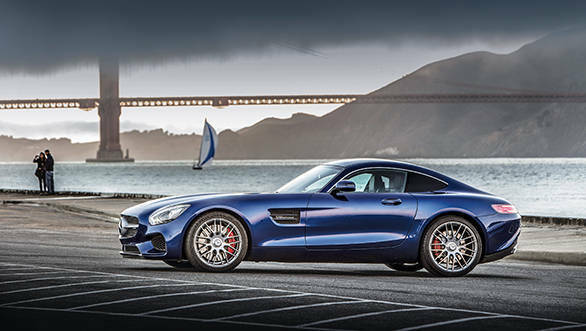 The AMG GT S gets a standard rear-axle locking differential. Our car also had the AMG Dynamic Plus package which is optional and adds dynamic engine and transmission mounts to further enhance stiffness and improve agility. Except in the Dynamic Plus package, you get stiffer spring ratings and that results in a harder ride. But true to their word, the Mercedes-AMG GT S does feel remarkably dynamic and agile. Out on the racetrack, it's an incredibly sharp sportscar and while you do need the electronics to keep you relatively safe, taking off the reins can also be quite a lot of fun. There is just so much torque, it's always willing to step out and indulge in a wave of hooliganism which befits its character. This is the Teutonic interpretation of the American muscle car, just a bit meaner and, leaner with a more potent bite.